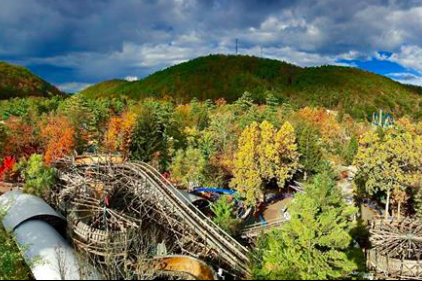 Aerial view of Knoebels Amusement Resort in Elysburg, Pennsylvania. Four people, including three children, were hospitalized after a tree fell at a campsite at Knoebels Amusement Resort in Central Pennsylvania Tuesday evening, according to reports. The incident occurred around 4:30 p.m. at the Bermuda section of the park's campgrounds, causing officials to temporarily close the area to investigate, WNEP reported. Those injured were 41-year-old Scott Keeney and his three young family members, Caitlyn Keeney, 11; Ryan Kenney, 8; and Grace Keeney, 4, police told PennLive. A 40-foot section of the tree fell during a storm. Caitlyn Keeney remained hospitalized in critical condition Wednesday, and Scott Keeney remained in serious condition, a spokesman for Geisinger Medical Center told PennLive. Grace Keeney was listed as fair, and Ryan Keeney was treated and released, the spokesman added. No other campsites were affected during the storm, a park spokesperson told PennLive.